One of the coolest things about the App Store is the sheer amount of obscure ports it exposes us iOS gamers to that we would have otherwise missed. Prior to the news of the iOS port hitting our forums, I had never heard of Battle for Wesnoth [$4.99 – iPhone / iPad] and tonight its creators are unleashing another open source game on to the App Store, Frogatto & Friends [$1.99]. 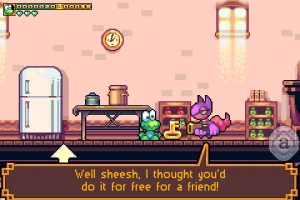 Frogatto is a platformer with some of the most blatant classic video game influences I’ve seen in quite some time, and I mean that in the best way possible. Everything from the style of the fantastic pixel art that makes up the game, to the way Frogatto deals with enemies, to interface elements all seem to be lovingly lifted from memories of the sixteen bit era. In the game you play as a tiny unemployed frog who sets out for adventure and employment. It doesn’t take long before the villain of the game, Big Bad Milgram, is revealed, and your sights are set on restoring order to the world. Fighting through various boss fights, solving puzzles, and making your way through tons of enemies and platforming obstacles are all vital parts of Frogatto & Friends. Much like Battle for Wesnoth, Frogatto is freely available online to play on either Mac or Windows machines (as well as some out of date Linux builds). It’s really a toss up as to which version is better, as platformers like this really need the physical controls that playing on a keyboard provide. On the other hand, the iPhone port is great, but I’d really love to see some better game save handling. Currently if you quit the game for any reason, you lose your progress from the last save point. Save points are plentiful throughout the game, but I really think we’re at a point now where if you’re releasing something more than a simple time waster you should really include better save state handling. Even using fast app switching loses your progress, which is a total bummer given how awesome it has been with iOS 4 to quickly and easily switch between checking your email or browsing the internet while playing a game. 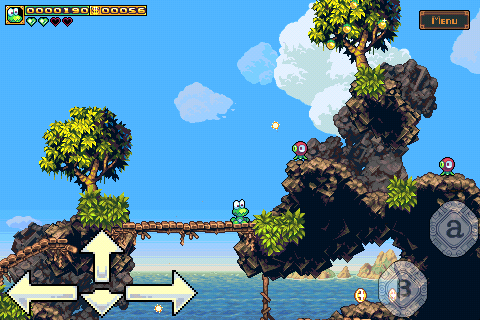 If you can get past losing a little bit of progress if you quit the game, Frogatto is totally worth checking out. I’ve been completely captivated by both the art of the game, and the game world itself; so much so that while playing through the other games that have been released tonight to write about I kept wanting to go back to Frogatto & Friends. I’m a total sucker for games like this, and I doubt I’m alone on that. If nothing else, at least give the free PC version a try. UPDATE: The developers have posted in our forums that they’re looking in to the save issues when the app is quit, and it sounds like only some people are experiencing the problem. Much like Battle for Wesnoth, they plan on maintaining and improving Frogatto with updates. ‘Pirates Outlaws’ Review — Pirates, Strategy, Card Battles – Oh, My! Could you please help me to find the game?